Sometimes you can see the darndest things from a car window. Things like this. 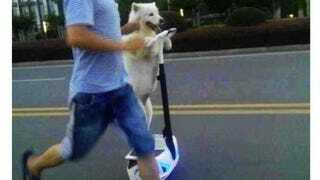 Recently, images appeared on a Chinese social networking site showing a man jogging down the street, with a dog riding what looks kinda like a Segway (but might be this). The images were apparently taken in Shenzhen and then circulated on the Beijing Times and China.com. Obviously, a sight like this is very surprising, with people in China wondering if this is even legal. Though, it looks like they're stopping at a red light.